The following resources can be helpful at any point in the research process, but might typically be used at the beginning to get a sense of context. Encyclopedias and dictionaries can be used to find basic information about an artist, about the history of art in a given country or region, about artistic techniques and materials, about schools and movements and terminology in art, and many other background, overview, or contextual facts. Chilvers, Ian, editor. Dictionary of Twentieth-Century Art. New York: Oxford University Press, 1998. Biographical entries on artists and other people in the art world, and on art movements, techniques, media, organizations, and serial exhibitions and publications. No index or bibliographies. Chilvers, Ian, editor. The Oxford Dictionary of Art, 3rd edition. Oxford: Oxford University Press, 2004. Deals primarily with Western and Western-inspired painting, sculpture, printmaking, and drawing from classical Greece to the present. Treatment of the modern period includes conceptual art, video art, and other fields of artistic activity now associated with the traditional fine arts. Does not include architecture, design, photography, and applied arts. About three-quarters of the articles are biographical, covering artists, patrons, collectors, dealers, administrators, and writers. Other articles cover styles, movements, materials, and techniques. Includes a chronology that fits Western art into a wider historical context. Mayer, Ralph. Dictionary of Art Terms and Techniques. New York: Crowell, 1969. A general one-volume dictionary with succinct definitions of terms that cover painting, drawing, sculpture, printmaking, and ceramics. Architectural terms are not included. Especially useful for definitions of technical terms, processes, and materials. Includes a classified listing of books for further reference. Old, but to date no other publication has superceded or bettered it for descriptions and definitions of basic techniques. Onians, John, editor. Atlas of World Art. London: Laurence King Publishing, 2004. This historical atlas of world art is arranged chronologically, with chapters on hunting/gathering (40,000–5000 BC), agriculture and urbanization (5000–500 BC), war and empire (500 BC–600 AD), religion and the ruler (600–1500 AD), exploitation and display (1500–1800 AD), industry and science (1800–1900 AD), ideas and technology (1900–2000 AD). Within these chapters are sections for the Americas, Europe, Africa, and Asia and the Pacific. Text and maps trace the development, influences, and transmission of art worldwide throughout human history. Oxford Art Online comprises the searchable full text of The Dictionary of Art, edited by Jane Turner (see below and right), the Bénézit Dictionary of Artists (see under Biographical resources), The Oxford Companion to Western Art, edited by Hugh Brigstocke (see under Histories, handbooks, & bibliographic guides), the Encyclopedia of Aesthetics, and The Concise Oxford Dictionary of Art Terms. Entries are continually being added and updated; articles updated since their original publication in print are date-stamped. Includes extensive links to images. Patin, Thomas. Artwords: A Glossary of Contemporary Art Theory. Westport, CT: Greenwood Press, 1997. Includes 400+ terms and phrases “that have recently entered the discourse on visual art.” Entries are substantive (the article on “feminism” covers several pages, for example) and include key writers and practitioners; they also include cross-references. Selected bibliography. The Penguin Dictionary of Decorative Arts, new edition. John Fleming and Hugh Honor. New York: Viking Penguin, 1989. Revised and expanded edition of “the best comprehensive dictionary of the primary forms of Western decorative arts.” 4,000+ entries on “furniture and furnishings” (movable objects other than paintings and sculpture) in Europe from the Middle Ages onward and in North America from the colonial period. Selective articles on such non-Western arts as carpets and ceramics. Includes definitions of stylistic and technical terms, accounts of materials and processes, biographies of leading craftsmen and designers, brief histories of notable factories and workshops. “One of the most significant art reference works ever produced – a monumental….attempt to encompass the field of art history" from prehistory to the present worldwide. The mandate to establish geographical balance makes this work “the most comprehensive coverage of the arts of Asia, Africa, Australasia, and the Americas ever published in one source.” Entries include biographical material on artists, dealers, art historians, and other figures in the art world; coverage of the history of art in specific countries, cities, and archeological sites; and detailed entries on art theory, movements, art forms, building types, and art materials and techniques. Articles include bibliographies. Well illustrated. Can also be searched electronically (see Oxford Art Online, above). Urdang, Laurence, and Frank R. Abate, editors. Fine and Applied Arts Terms Index, 1st edition. Detroit: Gale Research, 1983. “An alphabetical guide of sources of information on more than 45,000 terms used by museums, art galleries, and auction galleries in the English-speaking world, and by artists, artisans, designers, and professional in associated fields, including words and phrases that describe objets d’art, objets de vertu, bibelots, antique furnishings, jewelry, rugs and carpets, paintings, engravings, drawings, sculptures, as well as designs, styles, periods, influences, motifs, ornamentation, components, shapes, production techniques, materials, and finishes, the entries gathered from standard reference books and auctions catalogs, with sources and illustrations indicated, the whole complemented by a descriptive bibliography of all materials indexed.” Entries include the sources in which a definition can be found, with page numbers for the definition and for illustrations where applicable. Claude Monet. 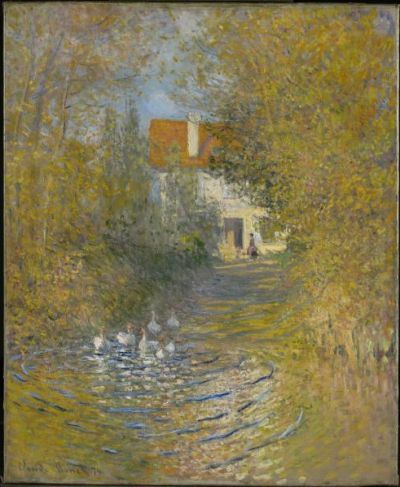 The Geese, 1874. Oil on canvas. Sterling and Francine Clark Art Institute, Williamstown, MA. The Dictionary of Art defines itself as a ..."critically organized repository of historically significant information" however I prefer to refer to it as an astounding feat. Written over a period of 12 years by 6,700 contributors who hail from 120 different countries, the set comprises 41,000 articles illustrated with 15,000 reproductions and documented with 300,000 bibliographic citations, this reference work does not disappoint librarians who have long awaited its publication. Exceeding expectations, the Dictionary contains not only biographical essays on artists, architects, designers, and craftspeople but also on collectors, dealers, art historians, art museum professionals, and critics; entries on sites, terms, countries, peoples, institutions, periods, and art movements are all also included. Cross references throughout the text ensure that the potential reader is led to variant names, titles, related topics or influences. The Dictionary of Art is searchable online through Oxford Art Online (find the link at left).